As course designers, we want to give learners the opportunity to get additional information when and where they want it, without any hassles. 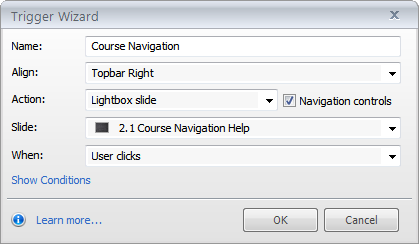 The Resources feature in Articulate Storyline, which puts a tab right on the course player, gives learners one-click access to file attachments, website links, or both. But there’s another way to give learners the same easy access to a wider, more dynamic variety of content: create a custom player tab that links to lightbox slides. Wider variety of content types available. A light box slide can have any kind of content that a regular Storyline slide can have. So in addition to basic text and images, your lightbox slide can include more dynamic content such as animations, buttons, audio, video, and even things like markers, web objects, and screen recordings. Ability to include multiple slides. By including navigation controls, your learners can explore a whole series of slides within the lightbox. You can either select the Navigation controls option to use Storyline’s built-in player Next and Prev buttons or add your own custom buttons. No additional windows or applications. Another nice thing about lightbox slides is that they are displayed right on top of the current slide without any potentially confusing additional windows or applications to open. When you close the lightbox, you’re returned right back to the exact place in the course you started from. Check out this published example demonstrating three different ways of using a lightbox in place of the Resources feature. 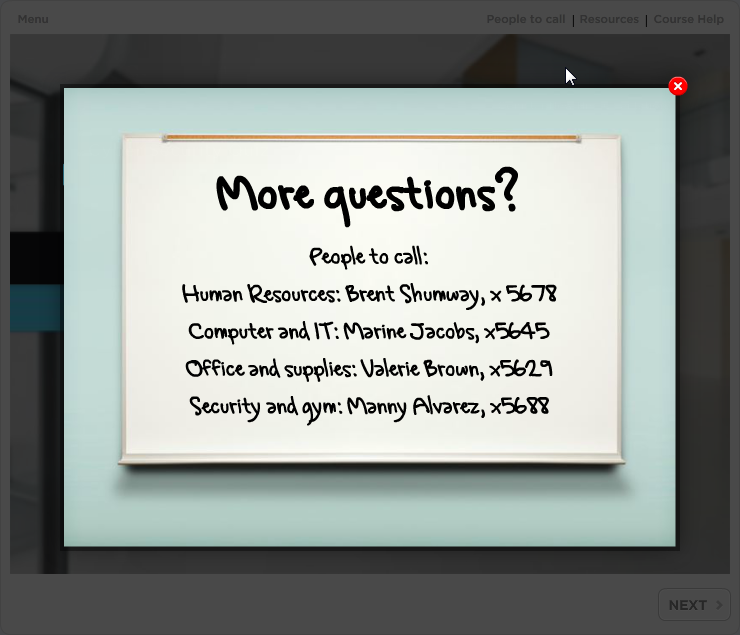 One uses a screen recording (connecting with us on Facebook), one uses a regular informational slide, and one incorporates some markers animated via the timeline. I’ve also included the standard Resources tab for comparison. Ready to try it yourself? Watch this tutorial to learn how to quickly add a media-rich lightbox to a slide or the course player in Articulate Storyline. If you want to try this yourself but don’t have Storyline, no problem. Just sign up for a fully functional, free trial. And don’t forget to post your questions and comments in the forums. We’re here to help! For more e-learning tips, examples, and downloads, follow us on Twitter. I like your graphic of the white board. Can you share it with me? Hi Mike, Thank you for the tutorial. I added audio to the course which has light box slides. When I close the ligh box slides, I am returned right back to the primary slide but the audio starts again. Under slide properties, I've chosen '' when revisiting resume saved state', but it didn't work. Any suggestions? Hi Viviana! Are you saying that the audio on the slide behind the lightbox restarts when returning to it from the lightbox slide? Do you have any other triggers? By default, a lightbox slide should pause the audio on the regular slide and closing the lightbox should restart the audio where it left off. Hi Mike, than you for your prompt respose. I don't have any other triggers. When I go back to the slide behind the lightbox slide, the audio of that slide re starts. The slide has four buttons, each ones connected to a light box slide. It happens with all of them. I tried to upload the course, but I couldn't. I published it for the Web and when I tried to upload it , an error message shows up. Should I use another publish version? Can you try the source (.story) file? I just sent you a 'request access'. the tutorial video does not play?